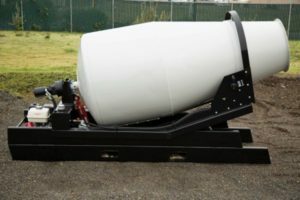 Who uses Cart-Away concrete? Why? What? Where? The following findings are from of a ten-day field survey conducted in several rental and landscape supply locations. 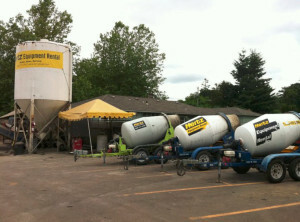 Each location serves their community with a small concrete batch plant and a fleet of trailers. 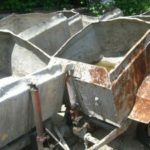 The purpose of the survey was to discover who used concrete in a trailer and what projects were being served. Your customer mix will probably be very much like what we report here. But first, some background on trailer-delivery. In the 1970’s, and even today, small concrete projects require the payment of a short-load fee. 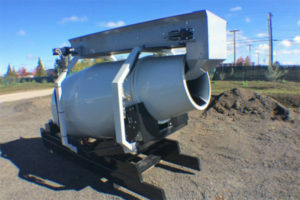 This extra delivery charge created an opportunity for hundreds of forward-thinking business people to make money selling concrete in a trailer. 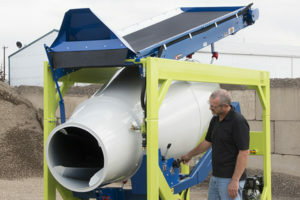 This self-delivered concrete niche started in the 70’s with dirty little tubs on wheels, and has become a respected and critical part of the concrete supply chain. No longer is this a service with low quality concrete – Now contractors depend upon Cart-Away for high quality concrete to complete many of their top projects. Over time, the equipment has evolved from the slow and impractical tubs, to the quick-mixing drum trailers of today. In addition, Cart-Away success have been proven by the test of time in communities of all types, all around the country. The good news is that there are still Short-load fees and Stand-by charges which will drive demand to you. Today, your odds of success and your return on investment have never been better. 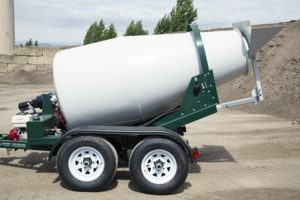 Who are Your Cart-Away Concrete Customers? The survey found that a full 63% of the customers are contractors of some sort. Next, we found that 31% of the users are do-it-yourself shoppers and 6% are city or county municipalities. The most interesting thing that we discovered is that the muni and large contractors where actually the largest volume customers by percentage. Of the 1700 yards that an average location will produce per year, about 1070 yards will be going to the highest of all repeat customers, the contractor. The quality of the concrete, the savings in time and money all combine to build a strong repeat business. Repeat users make up 84% of the Cart-Away Concrete that is sold in your location. With multiple visits, there will be ample opportunities to sell other products or services. In fact, of all repeat concrete customers, 32% use the concrete service at least every month, with 36% using the service at least every week. Adding to your pool of customers is the first-time user who has seen your trailers working around town. These first-time customers represent 16% of all your concrete sales and highlights the value of ready-mix as a “customer magnet”. Your good customer service and the quality of the concrete will build a growing revenue stream from new and repeat business every year. What is this concrete used for? why you have such a great opportunity today. 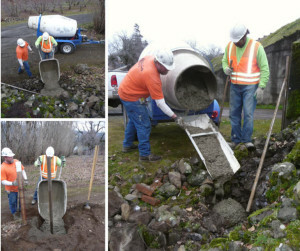 The survey found that pouring some type of small slab (56%) is the most popular use for concrete out of the trailer. Both contractors and do-it-yourselfers listed driveways, patios, spa and shed slabs as the most common slab that they pour. Sidewalk repair (27%) and underground construction (20%) are the main use by contractors and municipality customers. Other projects listed include footings, fence posts and mow strips. How do the customers find this concrete? As the construction community learns that you have concrete available to them, they will start using you instead of waiting for a truck or paying delivery fees. It is clear that referrals are always an important source of new business. And 9% of our respondents said that buying concrete at the survey location was recommended by someone else. After years of learning how Cart-Away locations get customers, we highly recommend that you partner with local transit-mix companies for referrals. Dispatchers from the large ready-mix firms will send customers to you because they do not like to serve the small load customer – There is no money in this market for them. Further, the study showed that regular customers are the best source of ready-mix sales at 60%. This makes it critical that proper signage and counter sales presentations are made apart of any marketing plans. Signs on entry fences, on cement silos and behind the sales counter introduce this service to regular customers. Invoice stuffers, telephone “on-hold” messages, counter reminders and grand openings also build sales for the regular customer base. Though the survey did not completely bear this out, it is important to be listed in the Ready-mix concrete section of the Online Google Local or Online Yellow Pages. 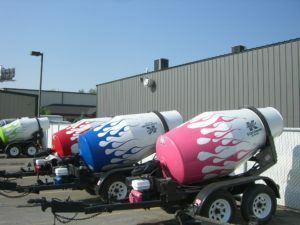 Many of the new concrete customers traditionally come from searching the internet. The Cart-Away sales team can provide you with many tips and ideas that will help you further market your new concrete business. Call Scotty at (800)909-9809 and ask for a marketing package. There is little question as to the success of adding ready-mix concrete to any construction related operation. Your success in this niche will be the result of your own efforts, combined with a strong support team. For the past 44-years Cart-Away and U-cart have supported the most successful concrete operations in this industry. This survey and other reports are only one of the extra services you can expect from Cart-Away. Ready-mix concrete production is as much art as science and real-life field experience is critical to your success. 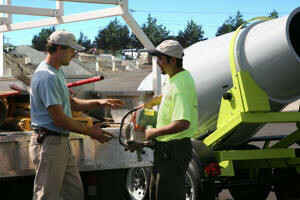 Many equipment manufacturers, anxious to sell you mixing equipment, have never operated a ready-mix business. In fact, the support team is as important to your success as the selection of mixing equipment that you choose! Cart-Away is proud to support you with an experienced team of professional concrete operators along with our line of quality equipment.